← What is the Proper Role of Government? Patrick Henry: Why Didn’t Anyone Listen to Our Most Passionate Proponent of Liberty? “The question before the House is one of awful moment to this country…. Mr. President, it is natural to man to indulge in the illusions of hope. We are apt to shut our eyes against a painful truth, and listen to the song of that siren till she transforms us into beasts. Is this the part of wise men, engaged in a great and arduous struggle for liberty? Are we disposed to be of the number of those who, having eyes, see not, and, having ears, hear not, the things which so nearly concern their temporal salvation? For my part, whatever anguish of spirit it may cost, I am willing to know the whole truth; to know the worst, and to provide for it. They tell us, sir, that we are weak; unable to cope with so formidable an adversary. But when shall we be stronger? Will it be the next week, or the next year? Will it be when we are totally disarmed, and when a British guard shall be stationed in every house? Shall we gather strength by irresolution and inaction? Shall we acquire the means of effectual resistance, by lying supinely on our backs, and hugging the delusive phantom of hope, until our enemies shall have bound us hand and foot? Sir, we are not weak if we make a proper use of those means which the God of nature hath placed in our power. Three millions of people, armed in the holy cause of liberty, and in such a country as that which we possess, are invincible by any force which our enemy can send against us. Besides, sir, we shall not fight our battles alone. There is a just God who presides over the destinies of nations; and who will raise up friends to fight our battles for us. The battle, sir, is not to the strong alone; it is to the vigilant, the active, the brave………..
Patrick Henry is one of most important Founding Fathers. It is very likely that we wouldn’t have pushed for our independence from Great Britain if it weren’t for Henry’s fiery speech that night on March 23, 1775 and for his constant pleas to the colonists to stand up for their God-given liberties. Once our independence was won, he refused to represent Virginia at the Constitutional Convention in 1787 because he was suspicious of the type of government that James Madison and Alexander Hamilton had in mind. In fact, in declining to go, he stated: “I smell a rat in Philadelphia.” He caught wind that Madison and other members of the Virginia delegation and Hamilton as well intended not to modify the Articles of Confederation, as their invitation stated, but rather to scrap them and start from scratch. But what most people don’t know is that Patrick Henry was a staunch anti-Federalist. He believed that Americans and the States would ensure their own demise if they ratified the US Constitution. He joined other famous Americans in publicly criticizing it. Those other Americans included Richard Henry Lee, who was an early President of the Continental Congress (under the Articles of Confederation) and then more famously the delegate from Virginia who presented the formal resolution to the Congress calling for a Declaration of Independence, NY Governor George Clinton (who so aggressively opposed the Constitution that the state of NY refused to ratify it), George Mason, of Virginia (who was so disappointed with the final draft of the Constitution that he refused to sign it), Elbridge Gerry of Massachusetts, and Robert Yates, a NY judge and friend of Clinton. In general, the anti-Federalists opposed the Constitution because they were much less optimistic than the Federalists about the ability of civic virtue and the system of checks and balances to keep the national government in check. Because they lost the battle over ratification of the Constitution, very little attention is paid to the anti-Federalists. In response to the criticisms of the Constitution by the anti-Federalists – published as a series of essays under such names as Cato (Clinton), Brutus (Yates), The Centinal, and the Federal Farmer (Lee) – James Madison, Alexander Hamilton, and John Jay wrote the Federalist Papers, to give proper assurances that the criticisms were unfounded. [It is ironic that those who supported the Constitution were called the “Federalists” yet those who criticized the Constitution for not protecting States’ rights enough were called “Anti-Federalists”]. Henry didn’t trust the assurances. Patrick Henry, one of my favorite Founding Fathers because of his honesty, passion, and sheer devotion to the exercise and protection of fundamental liberty, opposed the US Constitution openly and aggressively. He was concerned about the consolidation of federal authority and especially the power concentrated in the office of the President. A particular concern was the President’s authority and command over the armed forces. Henry predicted that a president could use the military “to run roughshod over the republic.” (Lincoln and the Civil War!!) He was highly skeptical of the broad taxing power delegated to the Congress. He believed the Constitution allowed the government to control the governed, with little ability and no obligation to control itself. And he argued that the Constitution effectively ignored the essential role of the States. Furthermore, Henry always wondered whether Americans had the moral fiber to safeguard the freedom secured by the American Revolution. By 1776, he saw a moral depravity that concerned him, and he believed it would eventually set the stage for tyranny. 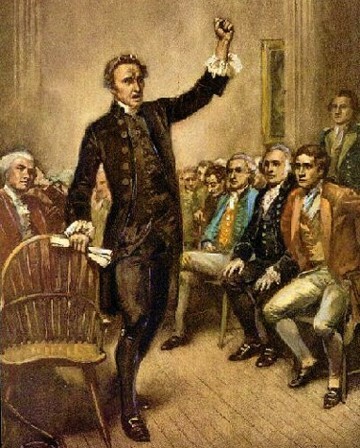 The delegates of the Constitutional Convention, he argued, foolishly assumed that all politicians would be virtuous men. He criticized many of the Founders and drafters, Christian republicans as they were, for not realizing that this assumption was a fatal flaw. “Nothing could check a national government entrusted with vast military might and the unlimited authority to tax…… Our human rights and privileges are rendered insecure, if not lost, by this Constitution,” he wrote. What he meant by this, as he often stated, was that the Constitution represented an outright repudiation of the American Revolution. As an alternative to all the States ratifying and binding themselves to document that he believed would destroy liberty and ultimately establish a tyrannical government, Patrick Henry proposed that States establish sectional confederacies (multiple republics). He further supported this approach because it was his firm belief that the Constitution would give special treatment to Northern states over Southern states and the latter would forever be prejudiced in representation and legislation. Another little known fact is that Henry proposed secession in 1788, certainly for Virginia, and for other states as well. Benjamin Harrison, one of the most conservative of the signers of the Declaration of Independence, from Virginia, was also critical of the new Constitution. He said that although the collection of States had its share of problems, the Constitution would “prove worse than the disease” (one of the “diseases” was the Constitutional Congress’ lack of enforcement power). Even Thomas Jefferson expressed reservations about the Constitution. He thought it was too “energetic” a proposal. In a letter he wrote to James Madison from France, he said: “I am not a friend to a very energetic government. It is always oppressive.” [Luckily for us, Jefferson was successful in finally convincing the writers of the Constitution to draft a Bill of Rights to set definitive limits of the government on individual rights]. 1 Response to Patrick Henry: Why Didn’t Anyone Listen to Our Most Passionate Proponent of Liberty?